SuperBee Wax Wraps provide an eco friendly alternative to plastic wrap. Our reusable beeswax wraps come in four sizes and a variety of prints, giving you the creativity and flexibility to customize for your home. The small beeswax wrap is the jack of all trades – perfect for leftover vegetables, covering mason jars, or keeping odds and ends organized. The medium beeswax wrap are ideal for storing snacks, while the large beeswax wrap can cover most bowls and containers. The Bumblebee Wax Wrap will cover your larger baking dishes, watermelon, or a bouquet of flowers. Be creative! 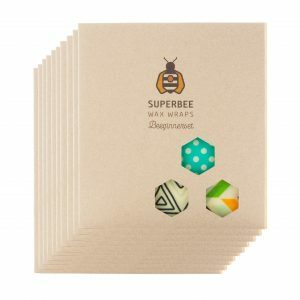 The possibilities are endless… SuperBee Wax Wraps are handmade with love from high quality, locally sourced materials: 100% cotton fabric, pure OTOP-certified beeswax, organic coconut oil, and tree resin.